From swimming right next to sharks, to jumping out of a plane, and even climbing the Sydney Harbour Bridge - us Sydney siders could be classed as being avid thrill seekers. On this, what is the scariest activity around in Sydney? Why? Definitely scuba diving on the Northern Beaches right near some sharks - phew, felt like I was having a heart attack. Bungee jumping at first was scary, but you get used to it - no different to a snake at Taronga Zoo. Want to drive a fast race car (like a V8) against the clock! Wow, you're a daredevil! I'd be too scared to try any of those...I'm a bit of a wimp. How about a ghost tour? The Rocks Ghost Tours and the ones at the old Quarantine Station in Manly are apparently pretty terrifying. I suppose it would depend on your fear. Skydiving, climbing the harbour bridge and bungee jumping are pretty daunting if you are scared of heights! I agree with Carolyn, ghost tours really creep me out and I have heard that the Quarantine base is really spooky. There are a few places around Sydney that will let you hold snakes and spiders but I think anything like shark diving or scuba diving near sharks is really scary! Also sting rays! There are a lot of places around the coast of Sydney where you can jump of high rock platforms into the ocean (Jump rock at Manly) but I would not necessarily endorse it as it can be really dangerous! The Bridge Climb would be the scariest for me. 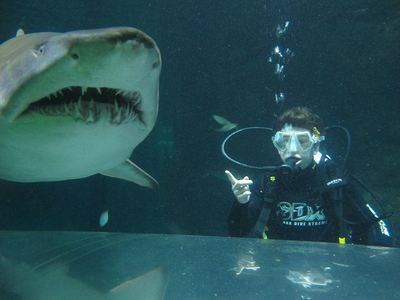 I've done scuba diving in the shark tank at Manly Sea Life and it was fun for me! Best place to get your clothes altered in Sydney?